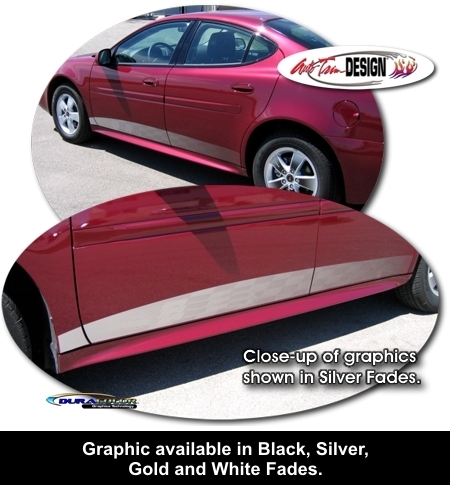 Set your '04-'08 Pontiac Grand Prix apart from the rest with this "Racy" Body Side graphic kit, designed specifically for the lower portion of the doors as shown. Graphics start solid at the front and is uniquely designed with a gentle one color fade with a "ghosted" Checker Flag pattern to the rear. Available in one (1) of four (4) different color schemes, these graphics will look Great! As an extra step, graphic pieces are over-laminated with a 2.5 mil clear laminate which will protect the graphics from miles of abuse. The kit is precut (NO TRIMMING required!) and packaged with one (1) Driver Side and one (1) Passenger side graphic. Each graphic measures 77.402"x 5.501" (196.60cm x 13.97cm).